Life in Nairobi is pretty simple for Kena: Make good marks in school, help her father as he runs for local office, take care of her forlorn mother, and play football with her guy friends. Though the lanky, androgynous teenager is more likely to be seen skateboarding around her housing estate than donning dresses like a “proper lady,” somehow no one ever questions her sexuality…possibly not even Kena herself. But when the beautiful pink-dreadlocked Ziki, the daughter of her father’s political rival, catches Kena’s eye, a world of possibilities opens up. As they share dreams of breaking free of familial and cultural expectations, it’s not long before local gossips’ lips start whispering. And in a place where homosexuality is blamed on demon possession, being true to yourself can have dangerous consequences. 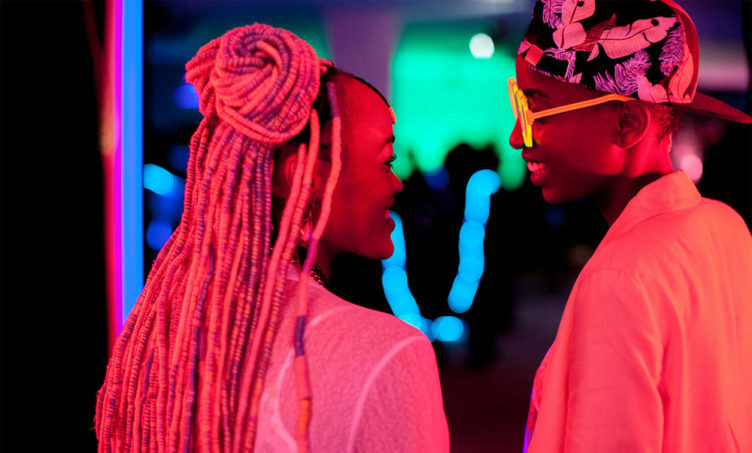 Banned in Kenya for “legitimizing lesbianism,” this tender, coming-of-age love story—the first Kenyan film to ever play at Cannes—is a revelation and an inspiration for all ages and genders.